Suffering from the odd breakouts and no I don't mean hormonal neither, I mean real acne breakouts can hurt a female & males self esteem. Finding products that work for you with a minimal step programme is important. There's been many skincare brands that celebrities have endorsed that we fall prey too. I decided to try the FaceB4* range with the hopes it will keep these breakouts under lock & key and even maybe the odd hormonal breakouts. I am normally so dedicated to my reviews and will go the whole nine yards but unfortunately a fortnight into this, I had to stop, listen to my skin & tears. FaceB4 Daily Cleansing Foam (100ml £14.95) This is an antibacterial face wash which is actually a duo, the cleanser and toner come out of one pump and the serum FaceB4 After Cleansing Serum (30ml £14.95), to use after you have cleansed and toned. The duo facial wash has a "patented ultra biocidal complex including Salicylic Acid" which is to help spots, redness and blemishes by removing the skins impurities. Every morning and night, I would use just these products. I never used any moisturiser because I wanted to just use what they provided. I would pump the foam into my hand after I've wet my skin and massage in circular motions over the skin making sure I clean around the problem areas. Once I've rinsed this off with warm water I move onto the serum, the serum I found different from others I have used, it was light but moisturising enough to not need a moisturiser afterwards. Within the first week, I started to get little rashes and became more oily on my skin. I had previously managed to get my oily parts of the skin under control so for this to begin to make my skin more oily it was strange. I then started getting odd spots around my mouth, chin and one big spot under my skin. Bordering on boil like, never had a spot like that before. When I ranted about this on Twitter a few followers said maybe my skin is just purging, on the purging topic, I've read two arguments that purging is bull and that purging is helpful, whatever it is, my skin was reacting badly. After two weeks, I just couldn't anymore. If this is meant to help me, I don't want it. If this is the a reverse of the calm before the storm, I can't hang it out. You can tell these photos were taken a few months ago, as it was when my eyebrows were butchered by Sweeney Todd. This was within the first week of using it, spots starting to appear all at one time. 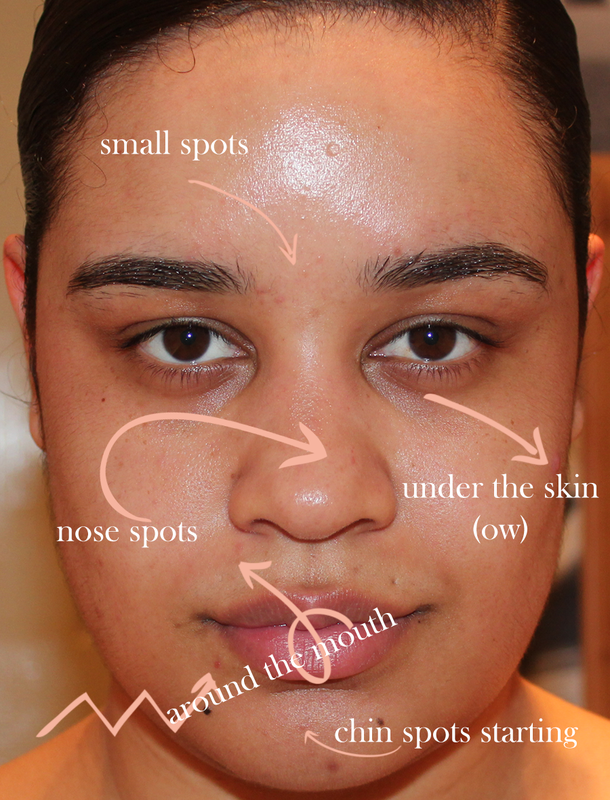 The spots I got were the small little rash types in between the brows, in the eyebrows, my chin, nose and the odd ones around the mouth and cheek. I preserved hoping it was just a phase but as they got more occupied and comfortable on my face, it was no more! The smell of the dual antibacterial wash has a slight bleach smell to it, it's a very medicinal scent, nothing you'd want to inhale and take in. There's no denying the antibacterial factor, I found the duo, drying for my skin once it was rinsed off. I didn't mind the serum, as I said previously it's light, easily absorbed and moisturising. Since using that, I really stuck to skincare that's natural and of course battled the pigmentation aftermath! ha ha ha ...lol @ '' the reverse of the calm before the storm''. i cant say i've heard about FACEB4 products before . i think two weeks is enough time to give a verdict. As for me ,i suffer from acne and spots,and my facial skin reacts badly to any scrubs or cleansers that foams. That Sweeney Todd remake made me audibly laugh out loud in my office, woops! I'd been wanting to try this, I'm glad I didn't. I have to say though, I was put off by the fact that these guys' main product is for stripping hair colour from dyed hair and the thought put me off, especially seeing as the other is so chemical-rich! That might just be my odd logic, but I always seem to get on more with brands who are location-orientated (i.e face, body, hair only etc. I hope your skin has calmed down now!